Hamsters, both dwarf and Syrian, are active creatures. They need a variety of toys and other items to provide them with opportunities for exercise, exploration and play. While they do appreciate time outside of the cage to explore in a hamster-safe environment, there are many things you can place inside the cage to provide exercise. Most hamsters make great use of a hamster wheel and your hamster's cage should have one. It is important to make sure the wheel is the proper size and try to get a solid surface wheel to cut down on the risk of injuries. Run-Abouts are the clear plastic balls (several styles are available) in which you put your hamster in and let them run around on the floor without worry of them getting away from you. 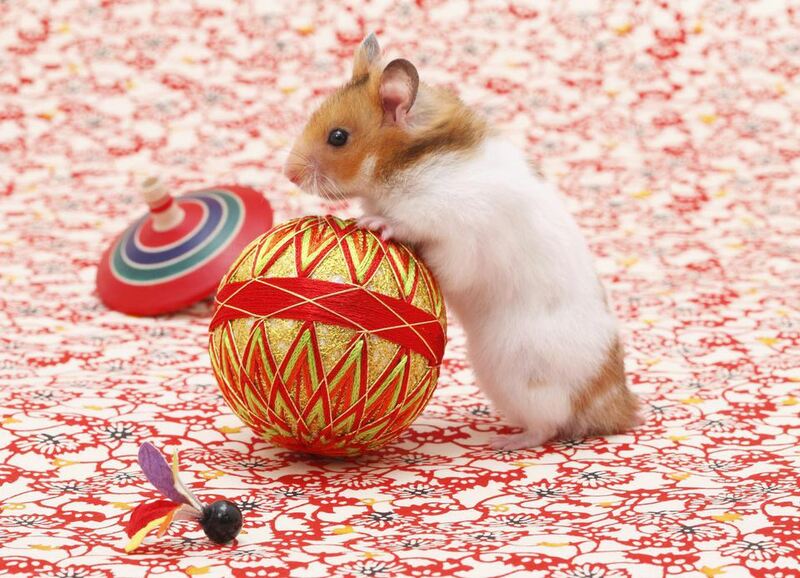 Both wheels and Run-Abouts are great ways to make sure your hamster gets enough exercise. Hamsters need a good supply of items and toys that they can gnaw on to keep their constantly growing teeth in good condition. Wooden pet chew toys are an ideal choice. Wood items not purchased from the pet store (stay away from cedar or other evergreen type woods) should be pesticide and chemical free. If you are unsure if a type of wood is safe it is probably best to stick with items made for pets. Pesticide-free fruit tree branches from your backyard or hardwood blocks or shapes that are not chemically treated are okay for your hamster. Willow balls, rings, and tunnels are also marketed for rabbits but and the smaller sized options are great for hamsters. In addition to wood chews, cardboard can be provided for chewing (and hiding). Hamsters also love cardboard tubes from paper towel and toilet paper rolls and there are now commercial tubes that are a bit sturdier and are said to be safe for chewing (e.g. Totally Chewbular Play Tubes and Critter Crunchy Chew Tube). There are a variety of climbers and houses/huts designed for hamsters and other small rodents. Wood ladders and climbing blocks are great for hamsters. If you can't find wood ladders in the hamster section of your pet store, check the bird section. You can also use hardwood dowels and wood to make your own ramps and climbing structures. Coconut shells can also be used to create huts and houses. Organic ropes (hemp, sisal, cotton) can also be used to construct hanging toys, walkways, and bridges in the hamster cage. Extreme caution is required with hanging toys and ropes -- use thicker sizes of rope and be absolutely sure your hamster (head, body, legs or toenails) cannot get entangled in any ropes used to hang items or use them only under close supervision. Caution is needed when it comes to plastic. Most hamsters love plastic tunnels and tubes and other play structures but chewing them can lead to problems. Some plastic toys will be destroyed very quickly and if your hamster is swallowing plastic pieces from chewing it is a big concern. When you offer plastic items keep a close eye on them and if your hamster is chewing too much discard the item. You can provide a dish of chinchilla dust bath or fine sand, in which you hamster may roll to keep its coat in good condition. Also, most hamsters love to dig so providing a deeper box of sand or sterilized soil big enough for the hamster to burrow in is a great treat for hamsters. These are not really necessary. If your hamster does gnaw on them it can help keep their teeth in good condition but they are very hard and many hamsters won't really use them. A variety of natural wood chew items is a better option (and necessary minerals should be provided via the diet).